The answer is yes: most Christmas lights do contain trace amounts of lead. So do miniblinds. And some cosmetic products. And extension cords. And computer cords. And batteries. And the power cords of essentially every single item of electrically powered equipment in your home. And even the soil in your lawn. And that "lead-free" plumbing that delivers drinking water to your tap? The same plumbing that conforms to modern legal requirements for lead reduction? It may contain as much as 8% lead. Even the dust in your home - against which you wage a never-ending battle with sweeper, swiffer duster, and vacuum - likely contains traces of lead. All of these common, everyday household items can contain lead, according to the Environmental Protection Agency. 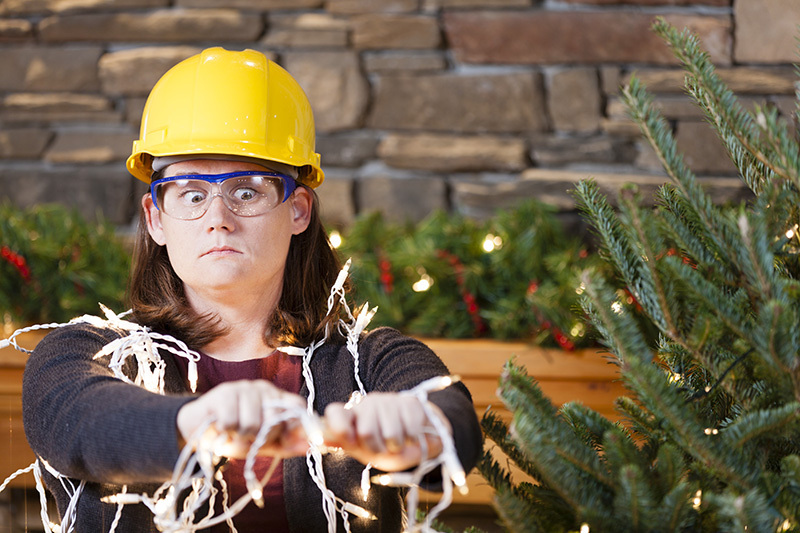 Should you be concerned about the lead in your Christmas lights? Of course you should. Just as you should be concerned about all of those other sources of lead in your home. But it should be a measured concern. There's no need to stop enjoying your Christmas lights. Just as there's no need to stop drinking water, trash your miniblinds, or discard every piece of electrical equipment that you own. Lead is a dangerous element. It can cause significant health problems. And multiple sources abound in the home. Yet great progress has been made in reducing our exposure to lead. According to the EPA, the lead levels measured in the blood of children have plummeted by 93% in roughly the last thirty years. And a recent Canadian study showed that blood lead levels have declined by 11% just since 2009. But in spite of the progress that's been made in reducing our exposure, it's still important to be mindful of the risks of lead exposure. It's also important to take appropriate precautions to help minimize exposure to lead. The trace amounts of lead found in Christmas light cords are used to help prevent cracking of the insulation that protects electrical wires. And according to the American Cancer Society, the "lead found in cords is not powdered, so users are not at risk of inhaling it." Because lead ingestion occurs mostly through the mouth and through the breathing of contaminated air. So Christmas light cords do not pose a significant threat for causing lead ingestion through the air, one of the two methods of lead ingestion. But handling Christmas light cords - or any other electrical cords for that matter - can leave a trace of lead residue on the skin. According to the Occupational Safety & Health Administration, lead is not absorbed through the skin. So the primary risk of absorbing lead after handling Christmas lights is through eating after handling the lights. And that's a risk that's easily avoided. 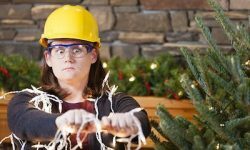 That's why the American Cancer Society recommends simply washing your hands after handling Christmas light cords, or any other type of cord for that matter, to avoid ingesting any lead that may have rubbed off on your hands. Also avoid eating or feeding children during the process of stringing holiday lights, or while otherwise handling power cords. And it's only common sense to keep light cords out of the hands of infants and toddlers. Mistletoe contains viscotoxins which can affect the pulse, cause gastrointestinal problems, and poison pets. Christmas candles cause many house fires and even loss of life each holiday season, and natural Christmas trees also pose a significant fire risk. Your eggnog is jam-packed with potentially health-threatening cholesterol. Does that mean that you should never again experience the thrill of encountering that certain someone under the mistletoe? Does it mean that your family can never again experience the joyful solemnity of a Christmas Eve candlelight vigil? Does it mean no more Christmas trees, or cheery cups of eggnog lifted in a holiday toast? It simply means that each of us should be aware of any potential risks, and take appropriate common-sense precautions. We do that every single day; it's simply a part of life. And that's one aspect of daily life that should never go on holiday. So enjoy your Christmas lights. After all, washing your hands after handling your lights is a pretty insignificant price to pay for all of the joy those lights provide every single holiday season.